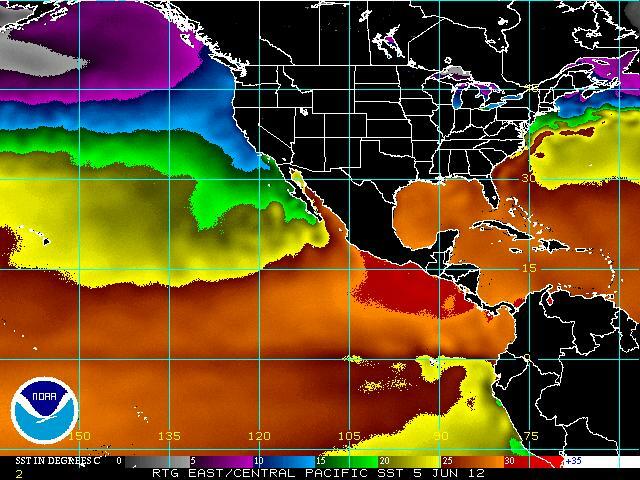 The Eastern North Pacific: It is boiling out there! The Sun above will soon reach the limit of the northern tropics marking the advent of summer 2012 in the northern hemisphere, and the ocean-atmosphere below are already showing the results of all the additional solar energy being absorbed by way of large areas of disturbed weather, storms, increased rain, warmer sea surface waters, and other signs that the heat exchange process is actively underway. 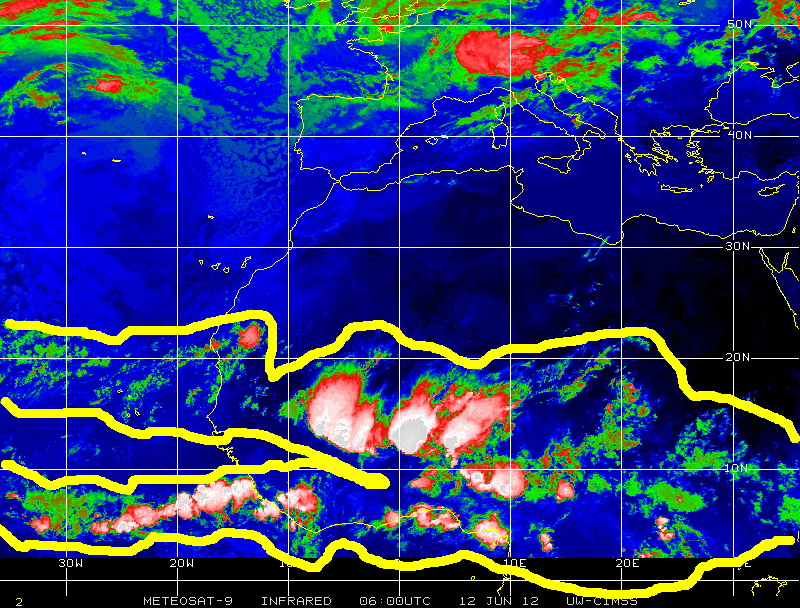 Three ocean basins in particular, have been showing increased signs of weather instability as we approach the change in seasons, the central/northeastern Indian Ocean, the Northwestern Pacific, and of more interest to us in Florida because of its proximity: the Easter North Pacific basin. 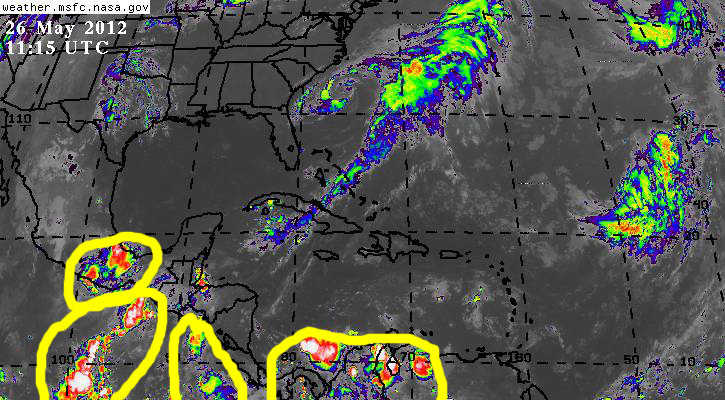 In a pattern that has become prevalent over the past 2-3 years, the region ranging from northern South America, mainly Colombia, Venezuela and Ecuador to Panama, Central America, Southern Mexico and a vast expanse of the eastern Pacific Ocean adjacent to these coastlines, has seen a nearly continuous transit of tropical waves coming in from the Atlantic, and the generation of tropical waves and cells of disturbed weather over Pacific Ocean waters offshore Central America and southern Mexico. In 2012 this pattern of tropical activity became noticeable toward the end of March and even more so in April and May, and it has already generated tropical storm Aletta that was active from 14 May through the 19th, and major hurricane Cat. 3 Bud from 21 May through the 26th of the same month. So far during the month of June 2012 the Eastern North Pacific basin appears to have entered a new phase of even higher activity. 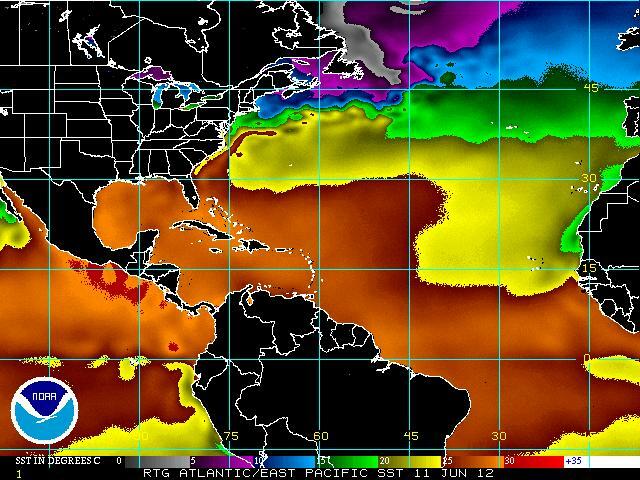 Sea surface waters in some areas of the basin have been above 30 degrees Celsius, tropical wave generation has been abundant leading to numerous instances of extreme rain and thunderstorms events in Panama, Costa Rica, Nicaragua, Honduras, El Salvador, Guatemala and Southern Mexico, with some flash flooding events as well. 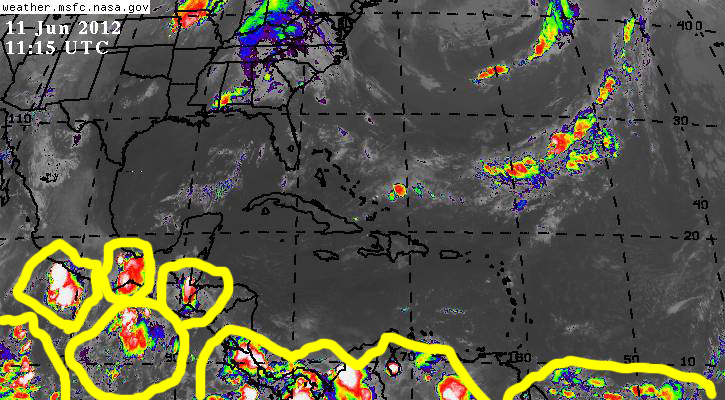 As of 11 June there were two areas of disturbed weather to the west of Nicaragua and Guatemala that exhibited some potentially cyclonic characteristics warranting close monitoring. Elsewhere in the northern tropics, tropical storm GUCHOL in the northwestern Pacific is moving west by northwest in the general direction of the Philippines and Taiwan, and the Indian ocean, the Indian subcontinent and southeast Asia have been experiencing large amounts of rain as the onset of the Asia Monsoon takes hold of that vast region. Quite interesting! Just as I was about to publish this brief post the National Hurricane Center issued an advisory for this sub-basin indicating tropical storm CARLOTTA, the 3rd named storm of the eastern Pacific 2012 hurricane season, has developed near the coast of southern Mexico. There are now two active tropical cyclones in the larger Pacific Ocean basin! 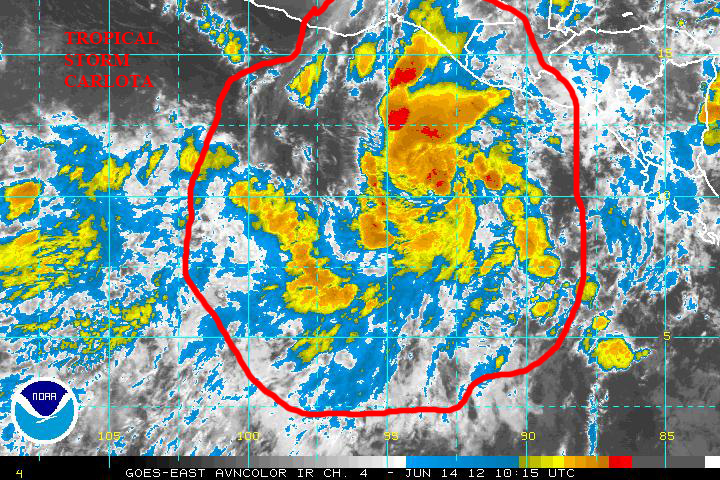 Also in the Eastern North Pacific sub-basin, there is an area of low pressure to the west of Tropical Storm CARLOTTA’s current location that may warrant close monitoring as it exhibits some characteristics that might lead to further development. CARLOTTA is now a category 1 hurricane moving northwest with maximum sustained winds of 130 kph near the Pacific coast of Mexico. Per the latest discussion emanating from the National Hurricane Center a Hurricane Hunter airplane was in route to get a fix on the latest intensity and tracking data, but based on previous advisories CARLOTTA appears to be continuing to intensify, while its track has shifted closer to the Mexican coast where it might make landfall some time in the morning of Saturday 16 June. Various atmospheric features are at play to the north and west of the system’s current location, which may alter its course over the next 24-36 hours. 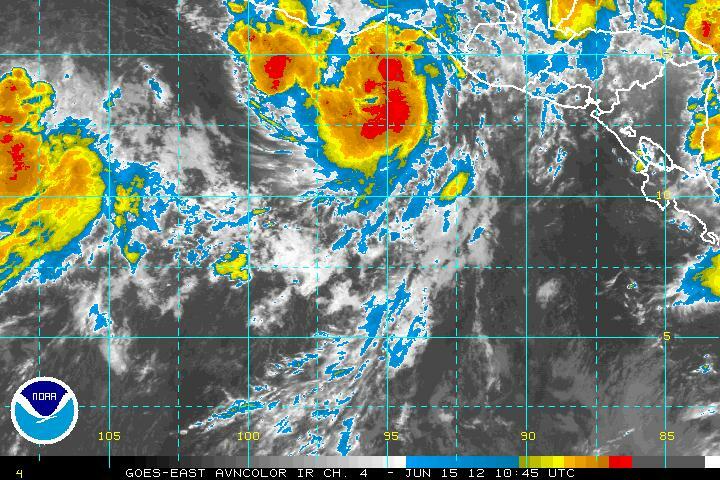 This is definitely one to monitor closely by all communities along the Mexican Pacific coastal region. Previous PostEarly start to 2012 Atlantic Hurricane Season is not that rare!Next PostOn 15 June 2012, two tropical cyclones active in the Pacific basin!